Led by redshirt junior quarterback Jarrett Stidham's six touchdowns (5 PASS, 1 RUSH), the Auburn Tigers overtook the Purdue Boilermakers 63-14 in Friday's 2018 Franklin Mortgage Music City Bowl. 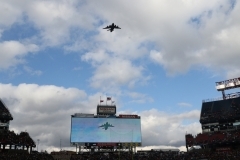 DraftNasty's Corey Chavous gives a peek at some of the images from Nashville. 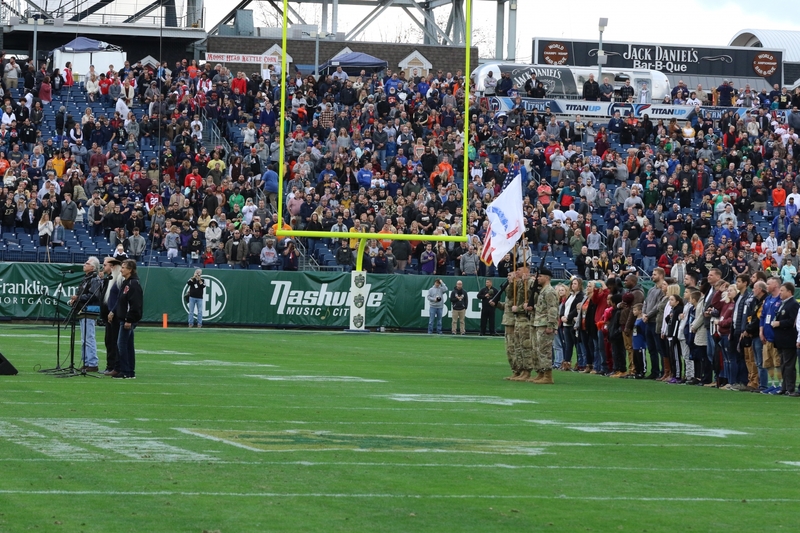 The Oak Ridge Boys, five-time Grammy Award winners, performed a stirring National Anthem for the fans. Tigers freshman defensive back Smoke Monday (No. 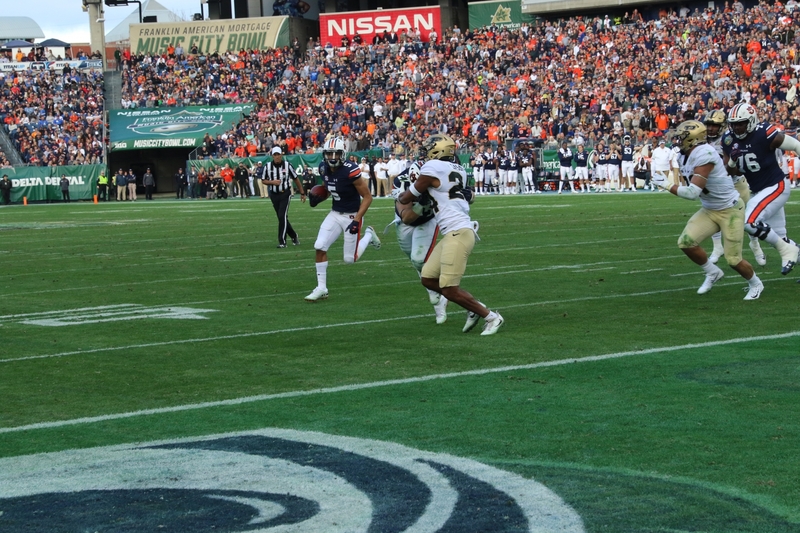 21 pictured) earned his first name on this big second quarter hit in kickoff coverage. Junior tight end Brycen Hopkins (No. 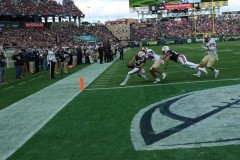 89 pictured) averaged 17.1 yards per catch on his 34 receptions (2 TDs) in 2018..
Purdue senior wide receiver Isaac Zico was unable to re-establish his feet in-bounds on this second quarter potential touchdown reception versus Auburn junior cornerback Jamel Dean (No. 12 pictured). 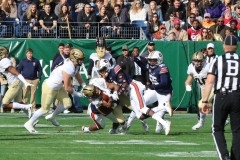 Freshman wide receiver Anthony Schwartz, who averaged over seven yards per carry in 2018, scored his seventh touchdown of the year in the second quarter. The Pembroke Pines, Florida native then showed off his guns to the crowd. Purdue freshman All-American Rondale Moore (No. 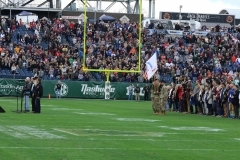 4 pictured) scored his second rushing touchdown of the season in the second quarter. 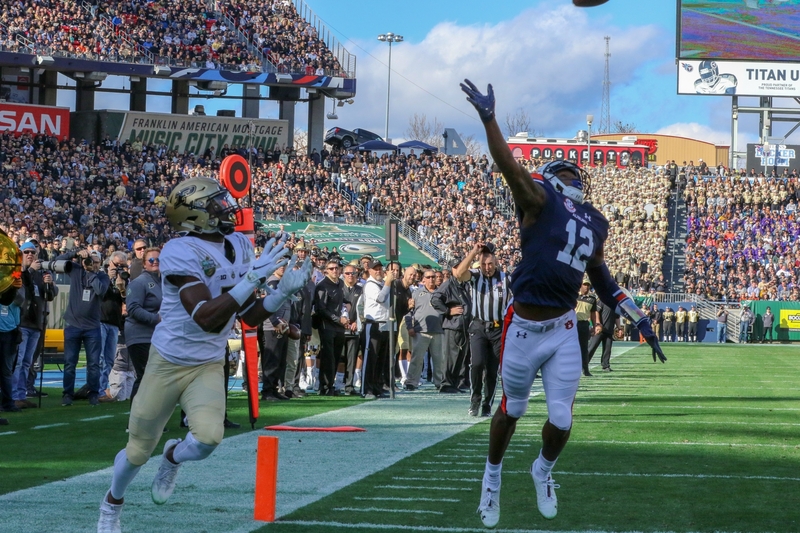 Moore finished the season with 114 receptions for 1,258 yards and 12 receiving touchdowns. Prior to the game the mood was set with a flyover that preceded a star-studded National Anthem. Auburn defensive end Big Kat Bryant (No. 1 pictured) returned an interception 20 yards for a touchdown in the second quarter. Auburn CB-WR Noah Igbinoghene (No. 4 pictured) averaged 28.7 yards per kickoff return in 2018, but he also proved to be a physical presence. He finished the season with 50 tackles. Sophomore linebacker K.J. Britt (No. 33 pictured) could be a factor for Auburn as well in the near future. 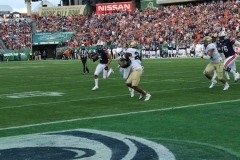 His tracking speed was on display in the fourth quarter when he tracked down Purdue's Markell Jones. Freshman offensive lineman Jalil Irvin (No. 50 pictured) pulls around on a quarterback zone read counter in the fourth quarter. The future could be bright for the Tigers with the potential of freshman quarterback Joey Gatewood (No. 13 pictured). The former four-star recruit rushed for 28 yards in his first extended action of the season. 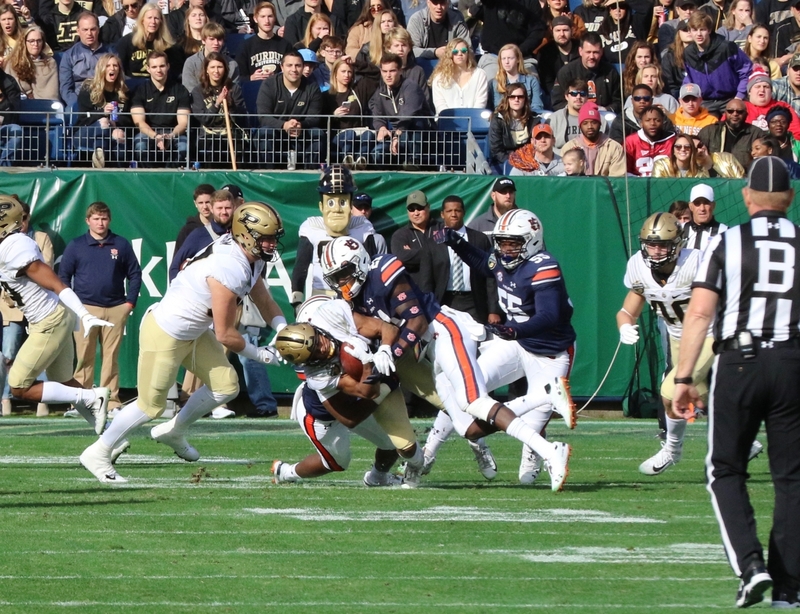 Auburn quarterback Jarrett Stidham stood tall in the pocket most of the afternoon. 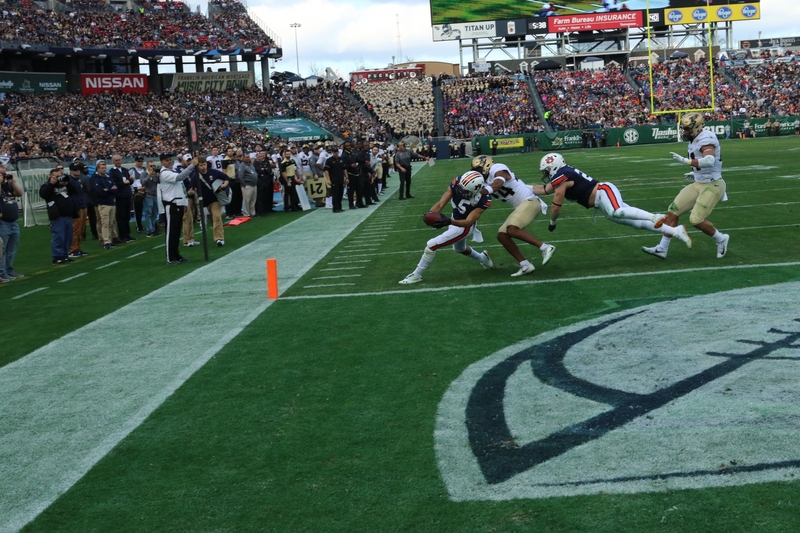 The story of the day was Stidham. The former Baylor Bears signal-caller accounted for 43 touchdowns (36 passing, seven rushing) over the last two seasons. He won 18 of his 26 career starts for the Tigers. 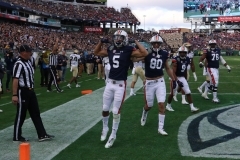 Auburn seniors Ryan Davis (No. 23 pictured), Darrell Williams (No. 49 pictured), Chase Cramer (No. 45 pictured) and Deshaun Davis (holding up trophy) celebrate the 2018 Music City Bowl championship on the podium with their teammates.